After my crazy week I couldn’t wait for the weekend! 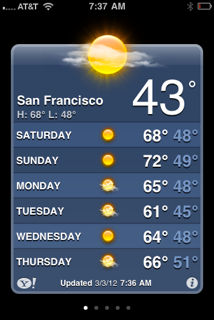 I was ecstatic when I woke up Saturday morning to the following forecast. Perfect weather to me! After being cooped up in the office all week I was long overdue for some fresh air and exercise. How spoiled am I to have this amazing backdrop for a run?!? 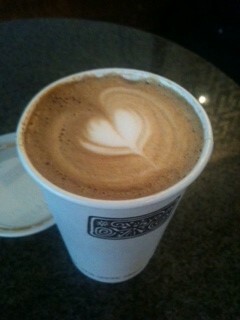 Made a quick stop for some latte love at Peet’s Coffee on my way back home. Aww…I feel so special! It was such a great morning that I topped off with some SooFoo cereal yet again, but with my own spin, adding peanut butter for protein and variety. Again, don’t knock it if you haven’t tried it. Since it was Saturday, I even helped myself to a second bowl. For dinner, I had a light salad while we explored San Francisco and when I came home I enjoyed a more appetizing, heartier bowl of SooFoo with hot sauce. 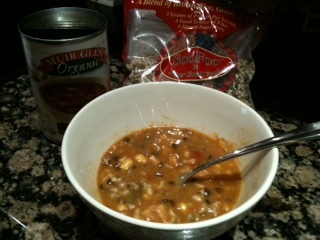 Sunday’s highlight was SooFoo and chili–topped with a little cheddar cheese and some chopped white onions. AWESOME! It ranks right up there with the top SooFoo foods I’ve eaten. Third time commenter, long time reader. When you cook up the SooFoo, do you cook a lot of it up and just refrigerate what you have leftover, then reheat as necessary? I am lucky enough to have scored a bag and want to make sure that I don’t mess it up too bad. Also that Chili looks awesome! “SooFoo and chili–topped with a little cheddar cheese and some chopped white onions” is making me hungry! Mr. Abel, yes, Kyle cooks up a large batch, eats what he wants and then stores the rest. It stores really good and it’s even good cold. I’d recommend trying a rice cooker as well, if you have one, with a dash of salt and some olive oil if you just want some base SooFoo. Thanks will have to give it a go! Along with the salt and extra virgin olive oil, I highly recommend tossing in a minced clove of garlic! It makes a huge difference and I do that every time. I have to admit, I cheated and used a can of chili for this meal. 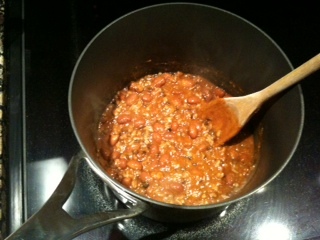 However, I have made SooFoo with an old family recipe, which I call “California Skinny Chili”. Cook SooFoo in a rice cooker or on the stove as directed. Brown turkey and onion. After SooFoo and turkey are done, put into a pot with the other ingredients and simmer on low heat for 30-40 mins. 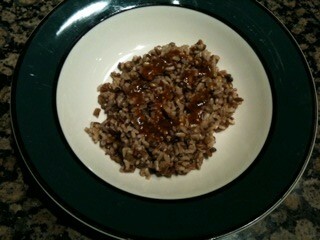 Serve with shredded cheese and chopped raw onion. I’m not sure you can call it “healthy”, but it’s “healthier” than most chili.